8.5” drop handle height with detachable, adjustable strap. Dimensions 5.5W x 15.5H x 14L in. Let your customers or love ones shoulder the task of promoting your message or company with custom promotional Alternative® bucket tote bags. These bucket tote bags are perfect for any occasion. Alternative represents quality materials, durable, construction and design clarity. Feature with zippered compartment with interior zippered side pocket and dedicated padded pocket for iPad, Surface, or other tablet device. Front gusseted pocket with snap closure. Reinforced handle. 8.5" drop handle height with detachable, adjustable strap. Interior features faded striped ticking details. Start customizing these bucket tote bags with your brand name, text, logo or even with your advertising slogan. Our online design lab is so easy to use. 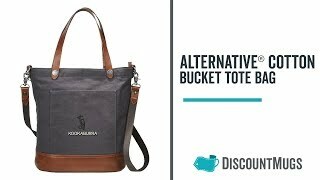 Place your order today for these durable personalized Alternative® bucket tote bags and enjoy guaranteed lowest prices only at Discountmugs.com.